[Stephen] often finds the need to make his own PCBs at home, and when he got the urge to do some etching recently, he realized that he was fresh out of “Ferret Chloride and Bureaucratic Acid*.” Undeterred by his empty chemical cabinet, he poked around in his kitchen mixing together anything and everything that might have the ability to strip copper from a PCB. Now, we don’t necessarily recommend this course of action, but it seems that he finally hit upon a winner. He discovered a formula that can be made at home from simple and safe household ingredients which does the job quite nicely. A fair warning however, standard ferric chloride disposal procedures need to be followed when using this solution. If you want to know what he concocted in his kitchen as well as the chemistry behind it, you will have to visit his site, we won’t ruin it for you. You can however, see the solution at work in the video we have posted below. That’s pretty sweet. Any chemistry gurus have leads on a grocery store tinning solution alternative to go with it? WOW! What a great solution to a diy problem! If I understand the function of the salt correctly this would make for an EXTREMELY useful home etchant. You know how the more reactive chemicals used can destroy a board by being left to react too long. Not so with this solution. You simply add a low amount of starting salt and add salt in metered amounts until your board is well etched but not being eaten to pieces! If you measure the ingredients then you can etch the same board to perfection the next time by adding just enough salt to finish the reaction, but not so much that the chemical continues on to kill your project!!! Why the heck is this 3 videos here when it’s all one video on the site? I ought to give this a shot sometime. Now if only I had a good source for some cheap copper-clad board. Cheapest copper clad board I’ve seen, you’ll be surprised. And the expedited shipping is cheap, while actually getting to the US quickly. Drop a few balls of aluminum foil in to reduce the copper ions to the much less toxic copper metal and then basify with baking soda or ammonia to leave the FAR less toxic (hydr)Oxides of Aluminum. Your aquatic microbial ecology will thank you! Can the waste be discarded normally, after the aluminum/baking soda treatment? @Doc Oct – It was in three parts at the time I wrote the post, but he must have updated his site in the last hour or so. I have changed the embedded vid accordingly. Thanks for the head’s up. This is a variation of the etchant I have used for a very long time. You need an acid and hydrogen peroxide. The salt isn’t necessary. go to the neighborhood hardware store and buy muriatic acid , sold in the paint section. It is used to prepare concrete surfaces for painting. Muriatic acid is hydrochloric acid mixed with a small amount of water. Cost is about $5 a gallon. Pour two cups of acid in a plastic container and add 1 cup 3% peroxide. The mixture will start to get slightly warm from the reaction. Next add your pcb and watch it closely. This etches much faster than the Fe stuff. It will produce a toxic gas , a form of chlorine so do it outside. I would not do it inside, even if it is well ventilated. This is brilliant. I’ve been avoiding using Copper plates for print making because of Ferric Chloride, and switched to Zinc using Copper Sulfate and salt. This means I can go back to using copper. Sweet. Yes, this is not new, just HCl has been replaced by vinegar, just to be much slower. I think you are probably the last guy who I would trust with instructions for handling acid. Why? Well, since you asked, your 3% H202 solution is just about 97% water. If you stayed awake in chemistry class, you would know that “you add the acid to the water like you oughta”, no the other way around. Well, that’s just the niftiest thing I’ve seen all week. Huh. That reads like an insult, but it’s intended as high praise. @r_d Almost every hardware store has Muriatic Acid, it usually has a plastic bag around the bottle in the paint/concrete section. Just go look, the people working in these stores are often idiots that have no motivation to move product. Some do. I’m in a big city and had to go outside the city to get it. Stupid store rules. Some drug stores carry 30% H2O2 in gallon jugs for < $50. Idiots dilute and drink/bathe in the stuff as part of some misguided health craze. Don't do that. Standard answer is check with your local municipalities concerning hazardous waste disposal. But I think you can react ferric chloride with sodium hydroxide to form ferric hydroxide and sodium chloride. Ferric hydroxide is used in aquarium water treatments and an FDA approved dye in cosmetics and tattoo ink. You should look into it to see the proper procedure and wherther this reaction is feasible. So please DON’T FORGET that this solution is only “edible” BEFORE you etch. 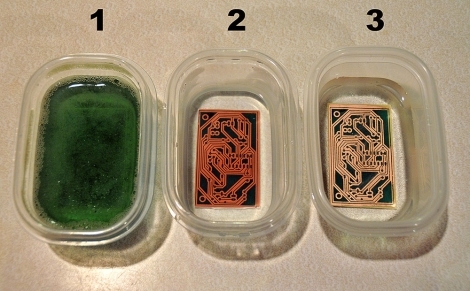 After you etch, the copper salts turn the etchant into a pretty toxic solution. Also, this is more or less virtually the same as using HCl/H2O2 to produce copper chloride etchant. In fact, I’d imagine most of the etching is happening because of the copper chloride, not becaus of the vinegar. One to remember, thanks. If you have Ferric Chloride though and want to conserve it, use the Wipe method, it works great! Interesting. I think I’ll stick with the 15% “safer” muriatic acid, but will try adding salt next time. BTW, don’t use Ferret Chloride. It will steal your PCB. That’s pretty impressive. I ususally use muriatic(HCl) acid and peroxide. Never tried adding salt…I have about 2L of HCl, when that runs out(maybe in 20 years ha ha) I’ll give acetic acid a chance. Don’t want to be a wisenheimer but she is right. You are right when we are looking at decomposition induced by UV etc. In the mentioned case H_2O_2 reacts to water, its an oxidation of copper and so a redoxreaction, no radicals needed. H_2O_2 is not electron deficient. I think she wants to say that -1 is not as stable as oxidation state -2 for oxygen. Muriatic acid is already diluted , adding water to it will not cause a reaction like adding water to concentrated acid, the order doesn’t matter here. Neither method is safe to consume. Vinegar will not harm you but peroxide will make you very sick. The peroxide combines with the stomach acid and causes vomiting. Notice peroxide reads that you can use it for a mouth rinse but DO NOT SWALLOW. I was wondering if you could “ETCH” boards by using electrolysis by using the board as the copper source? FYI, if you want ‘live’ hydrogen peroxide, pick up some sodium percarbonate (i.e. the main component of Oxiclean) and mix it in hot water. It’s a hoax. The “tells” in this story are obvious. Sorry, but TGTBT. TBYB. Hint for disposal of used etchant. I use one of the plastic kitty litter containers with the screw on cap. They have nice large round openings that make filling easy, and a good screw on cap. They are tough plastic that seems to hold up well. It takes me a long time to fill one and I have never had one leak even storing used etchant for several months. Most communities in the US have open waste disposal for paint and other household chemicals a few times a year. I like whyhowhens suggestion of making the stuff less toxic before disposal, I’ll be sure to do that before disposing of my next batch. I have also used the old etchant to soak the ends of posts before putting them in the ground to prevent insect damage, I’m not sure how environmentally sound that idea is(?). It works very well though as my untreated mailbox post only lasted two years before being completely eaten, the one I soaked in used etchant is 3 years and still strong in the exact same place. Muriatic acid is also sold in hardware stores as acid to add to pool water. — So check the pool section if you have one. Now, H2O2 + NaClO should bubble off oxygen.. but in my experience it seems to carry HCl or Cl with it, making some dangerous gasses. Silly rabbit, nothing’s stopping you from putting traditional etching chemicals in your mouth. Hah, as soon as I read it I thought ‘vinegar and salt’ and I was very close there. As threepointone correctly warned, this stuff is non toxic only before you etch copper with it. Copper is toxic for health; there’s a reason why all developed countries stopped making cooking pans, pots and stuff out of copper a long time ago. qwerty : Yup.. its called “iron”. Sweet, I will have to give this a go with Brass as I have been doing some deep etching. As for disposal (and i have not needed to yet) I have a creeping vine called wisteria and cant seem to controll it or get rid of it. I have used all sorts of stuff including some old sump oil. I wonder what cupric acid would do to it if I sprayed it on. Copper actually kills germs and that’s why doorhandles were made from it (or compounds with it) in the old days I read. And as for the reason why it would not be used in developing countries: might it have to do with it being freaking expensive as hell? Or do they also not drive bentleys because they are too toxic? I’m kidding but I mean many countries in the developing world often have no clue about materials and toxicity and no government departments to regulate and police it either so to use that reasoning seems silly. They have kids hammering TV tubes in small bits for a living in many of those countries, with no protection. Oh and btw, most waterpipes in the western world are made from copper, so I think you are a bit confused in regards to the toxicity? And one more thing, you can get copper pans and bowls all over, they are bought by professional chefs (and the rich) mostly though since they are so expensive. Copper actually kills germs: yes, isn’t that your hint that it might be harmful to life? Copper metal is OK. Copper salts aren’t. It’s OK to use in pipes as it doesn’t dissolve in the water, which is usually slightly alkaline. However if you cook anything acidic in it (like fruit) it will dissolve a small amount into your food. New to DIY PCB etching (took some classes many years ago in college), what is he using to mask the PCB? Why not use the CuCl2 as a copper plating solution? The hydrogen peroxide likely oxidizes the copper to copper oxide which is then converted munched right away as the copper prefers the chlorine. I would just up the salt to start with as that is really what is driving the reaction. Just how nasty is this stuff compared to Ferric Chloride or Cupric Chloride (hydrogen peroxide and mutric acid)? Does this mixture require the same level of precautions as Ferric Chloride or Cupric Chloride when working with it? I can not find any consistent information on Preacetic acid other then it might be bad. There are several MSDS sheets that say Preacetic acid has a fairly low flash point. Different sources of information have differing data so it is hard to tell for sure. However you probably do not want to run this stuff through your heated bubble etch tank unless you like things going boom. Keep up the good work, and stay safe! After this hypothesis, the vinegar is to some extent a catalyst, where some amount of NaHO is formed. NaHO is a strong base better known as caustic soda, and it should be handeled with care. I would not put my hand into the solution after an etching has taken place. I wonder if heat will speed up the reaction. Okay what can we do to precipitate the Cu out of the solution once we’re done with it? Or an electrolysis that will attract the Cu ions to an anode or cathode? I saw one comment that insinuated that this is actually a hoax. Has anyone actually tried this? I’d be interested in a second account of how it works. This site has to have posted a half dozen times about using muratic acid and H2O2. A former electroplating shop laboratory analyst tells me that the mixture used is in the family of solutions called “chloride etches” in the trade. HCl plus copper reacts quite slowly. It will clean surface oxide off straight away but the bright metal will only react fairly slowly. Adding hydrogen peroxide oxidises the surface of the copper, which is then very quickly attacked by the HCl. If you don’t have HCl handy, acetic acid and NaCl will still produce (rather dilute but nevertheless effective) HCl sufficient to do the job.